Anti-abortion activists have been lobbying heavily in recent years in the nation's state legislatures, which since 2010 have passed more than 200 laws imposing new regulations on abortion. Supporters of the procedure are challenging many of the new state laws in court, contending they are unreasonable and prevent women — especially poor women — from accessing safe, legal abortions. Proponents of the laws say one of their primary goals is to test the limits of the Supreme Court's 1973 Roe v. Wade decision legalizing abortion. Meanwhile, the federal government is implementing its sweeping health-care reform law, which requires health insurance plans to cover contraception, leading two companies whose owners oppose birth control on religious grounds to sue the government — a case the Supreme Court will hear this month. 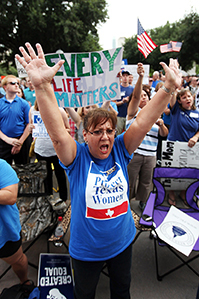 Anti-abortion activists say they'll bring their arguments to a receptive electorate in 2014, while their opponents say polls show a majority of voters continue to support abortion rights.